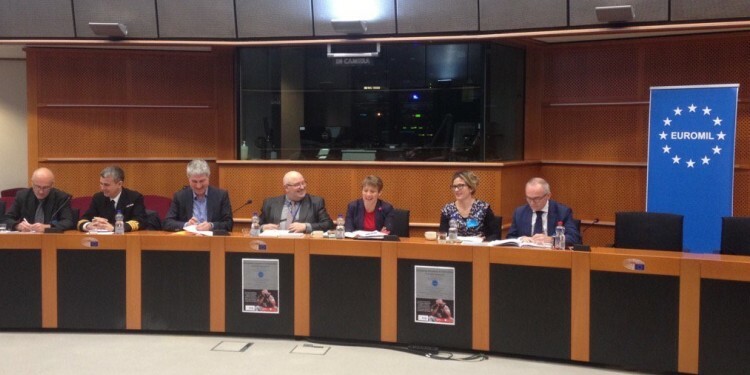 On 6 March 2018, EUROMIL organised a debate on “Increasing European Collaboration in PTSD Research” in the European Parliament with the kind support of the Members of the European Parliament (MEP) Ivo Belet and Clare Moody. Opening the debate, Clare Moody (MEP, UK, S&D) emphasized that governments have a duty of care, including medical and psychological care, towards the military personnel of their armed forces. Moody stated that the debate is timely for two reasons: First of all, on the same day, the European defence ministers came together to discuss the Permanent Structured Cooperation (PESCO) and decided to formally establish the 17 projects, amongst which one is dedicated to creating an EU Medical Command (mental health issues are however not mentioned in the draft documents on the project). Secondly, the European institutions are in the process of discussing the next Multiannual Financial Framework, through which eventually (health) research funding could be made available. Ivo Belet (MEP, Belgium, EPP) highlighted that a lot of discussions in Brussels turn around the concept of a “Europe that protects”. He added that in fact, the debate often resolves around military hardware and capabilities, but that “military software” i.e. the military personnel are frequently overlooked. In the specific case of military mental health care and research, Belet explained that the situation differs a lot within European countries, more comparable data and an increased cooperation in this field are needed. For Belgium, he added that 3% of personnel returning from missions suffer from PTSD. Emmanuel Jacob, EUROMIL President, agreed with Ivo Belet and pointed out that Europe could play a role in harmonizing the social standards of military personnel – if a social dimension would be incorporated within PESCO. Prof. Nicola Fear, Co-Director of the King’s Centre for Military Health Research in London gave an overview of the research being done at King’s College London. She explained that large sets of data are being collected from current and former service members. In total, around 6% of personnel report symptoms indicative of PTSD which is comparable to the levels seen in the UK general population. However, those deployed in combat roles reported increased rates of probable PTSD. Research has also investigated help seeking behaviours of affected veterans, “early service leavers” as well as the situation of service families. Prof. Fear emphasized that factors such as a lower educational attainment and relationship problems can increase the risk of a mental health problems, while unit cohesion, good leadership and strong family support are among the factors which protect military personnel’s mental health. Research furthermore showed that mental health problems are often comorbid with other problems such as alcohol misuse, violence and depression. The importance of mental health has been highlighted by the cross government strategy – “No Health Without Mental Health. Prof. Fear went on to emphasize that it is important to raise awareness about mental health issues amongst individual servicemen and women who may believe that the problems and difficulties they experience are “normal” without realizing that they have an underlying mental health disorder. In addition, awareness about available services and support needs to be increased so that, personnel can access the relevant treatment and support services. Commander Jannik Taanum Andersen, the chief of staff of the Danish Veteran Centre started by explaining that veteran care in Denmark is embedded in the public welfare system to which all citizens have access. With regards to veteran policy, Denmark is taking the multidimensional approach which includes monitoring and offering care and support before, during and after deployment. The Danish Veteran Centre was created in 2011 after a new veteran policy was adopted in 2010. The centre takes a holistic and interdisciplinary approach. The veteran policy was last updated in 2016, incorporating lessons learned from the past. Andersen emphasized that while there are certain unique national aspects of the Danish system, more collaborative projects in Europe are needed. Dr. Søren Bo Andersen, Head of the Research and Knowledge Centre of the Danish Veteran Centre, emphasized that PTSD is a very complex disease and, in some cases, only unfolds years after the deployment. Therefore, longitudinal studies and data collection are important. While most soldiers who experience a traumatic event are resilient, some develop PTSD afterwards. In this regard, the Danish research found differences between the place, time and period of deployment to a military mission and the likelihood of a mental health disorder. While mental health checks are conducted 7 months, 2 ½ years and 6 ½ years after the deployment, close to 14% of deployed personnel develops sever symptoms of PTSD (for ISAF 7 deployed to Afghanistan in 2009). Evidence-based treatment for PTSD is only effective for approximately 60% of the veterans, leaving a large group of individuals resistant to treatment. To improve treatment efficacy treatments that are tailored to individual symptom profiles and underlying biology are needed. New treatments options are being pursued including virtual reality and real-time training of neural brain activity associated with PTSD symptoms. The latest research is focusing on early intervention and the attempt to predict who might be at risk of developing a mental health disorder. Here, big data analysis, including data from the Danish’ citizens registries can help. Prof. Colonel Eric Vermetten from the Military Mental Healthcare Department of the Dutch Ministry of Defence, shared insights from both his academical research and practical experience with treatment of mental health disorders. He noted that “every war is bringing home its own disorder”: what we can increasingly observe with returning veterans today are “moral injuries” i.e. strong feelings of guilt and shame for which new treatment approaches and terminologies such as forgiveness and healing must be found and a transdisciplinary approach including psychiatrists and chaplains might be needed. Vermetten furthermore emphasized that, while 85% of soldiers returning from missions are resilient, those who develop mental health problems can be separated in two groups: A first group of veterans shows symptoms of PTSD one or two years after the deployment, this group can be treated with the established methods such as an exposure-based treatment. A larger second group of veterans only develops symptoms up to five years after the deployment. Unfortunately, it is much more difficult to find appropriate treatment for this group, as established approaches seem to fall short. In this context, Vermetten also shed light on the shortcomings of the pharmaceutical industry, which until now has only developed two drugs (in 2001) which can be used to treat PTSD. More research and innovation seem necessary in this field. New medical research projects are involving blood tests through which the prevalence of stress hormones can be tested even prior to deployment. Furthermore, genetic research might shed a light onto the genetic and epigenetic predisposition of military personnel before being deployed to identify persons at risk. Looking into the future, Prof. Vermetten also described how the use of technologies is already changing and will continue to change the monitoring and early warning as well as treatment of veterans with mental health problems. New technologies and virtual realities can also be used to efficiently train and prepare soldiers for military missions, including ethical training which was originally designed by the Canadian armed forces. In the Q&A session, participants raised other important aspects of mental health such as the duty of care towards deployed civilians and civilian rescue services, the techniques of mindfulness and mental readiness and the importance of peer support programs and third country decompression periods after deployments. In their concluding remarks, Ivo Belet and Clare Moody thanked the speakers for the diverse and important insight they shared and emphasized their perception that there is a lot to be learned from each other – European collaboration is imperative.